As most of you know, the famous 6-month (predominantly) ban wave has ended recently. However, apart from the suspension, Blizzard decided to strip all accounts involved in the ban wave of all their Gold, Honor and Conquest points. Personally, I can understand the last two, but as far as gold goes, I think that might be a bit of an overkill, especially for the people who were caught botting Archaeology achievements or something almost completely unrelated to farming gold. Honor and Conquest on the other hand are not as vital as gold can be, and can be much more easily obtained, whereas for a quick gold boost, you’re basically required to purchase a Token and sell it through the Auction House. As much as people say too much gold is irrelevant, having no gold at all is pretty bad. 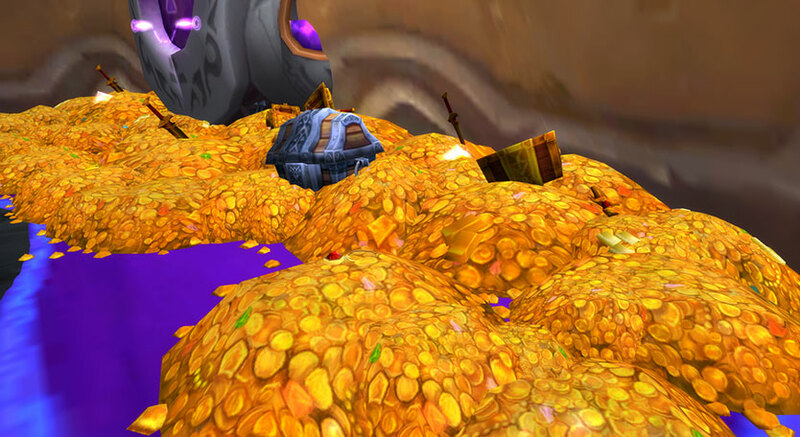 We figured we should write a post, reminding you of a few ideas on how to earn some gold legitimately in order to pick World of Warcraft back up, since after such a long while, some of you might have lost touch with the day to day Auction House business, and nevertheless, to welcome you back! Probably the easiest and fastest way to earn some quick cash if you have it already maxed out and running, and especially if you have a few more alts. Completing your daily Garrison missions on all your characters should net you quite a few item rewards which you can sell through the Auction House. For an extra bit of effort, you can use the materials you gain from placing work orders and your professions to craft items, consumables, vellum enchants, gems and so on for a bigger gold flow. Transmog runs – running old raids (AQ 20) can be a bit boring, but it usually pays out if you manage to snag a few BoE items and even pets, which you can sell for quite decent amounts of gold. Also, some raids such as Firelands / Dragon Soul / Bastion of Twilight / Blackwing Descent and such, if done on 25 Heroic, can neat a nice amount of liquid gold, as in looted gold. Even though Warlords of Draenor kinda butchered world farming, Vale of Eternal Blossoms is still a nice way to earn some gold, and also if you’re lucky with Skyshards, maybe the Reins of the Thundering Ruby Cloud Serpent mount! Using gold farming dedicated addons, such as Tycoon can also help you boost your gold income with very little effort, if you choose to just play the Auction House. Nevertheless, if your character was decently geared, or you’re a good player, the fastest and most efficient way to make gold legitimately is to boost people in challenge modes and Hellfire Citadel. With the Reins of the Grove Warden added as a reward from killing Archimonde on Heroic difficulty, a lot of people are willing to buy a quick boost to get their mount! All of the above methods are sure to net you quite a bit of gold if you’ve had issues recovering after a ban wave, although, none of them bring you gold fast enough, nor are very reliable for that matter. If you’re looking for a quick way due to raids or catching up on gear, you can always simply buy WoW gold. If you have any more ideas or tips on how to earn some quick gold, let us know in the comments! Stay out of trouble, and hope this little guide will help you guys pick WoW back and get back where you once were before the ban!